Typically I would simply imbed a link to a particular author’s piece or website that is noteworthy or otherwise relevant to the topics usually discussed here. It’s clear from President Obama’s State of the Union address  that gun control is a major goal for his second term. Obama benefits from the confusion created by media and anti-rights politicians who intentionally mislabel modern semi-automatic sporting rifles. “Weapons of war” were severely limited by the 1934 National Firearms Act , which required a stamp tax and registration for all military firearms purchases by private citizens. In 1986, the Hughes Amendment to the Firearm Owners Protection Act  (FOPA) limited civilians purchasing automatic firearms — true assault rifles used by military — to what existed in civilian inventory at the time FOPA took effect. As a result, sub-machine guns over 25 years old, like the Heckler & Koch MP5 , regularly sell for $20,000 or more. Murderers aren’t likely to spend $20,000 and then wait for ATF approval  of their purchase. Obama’s “more than a thousand” claim is confusing. Was he implying there were 1,000 firearms-related deaths in the last two months? Gun banners like the Violence Policy Center  claim “more than 30,000 Americans die in gun suicides, homicides, and unintentional shootings.” According to the FBI, a monthly average of 715 firearms murders occurred in 2011 , or 1,430 over two months. If Obama based his claim on government data not yet publicly available, this means America is experiencing a historic drop in firearms-related fatalities. The 1968 Gun Control Act  was supposed to reduce crime by — among other things — limiting interstate firearms and ammunition commerce to federally licensed dealers, limiting handgun sales to adults age 21 or older, and restricting long gun sales to ages 18 and older. 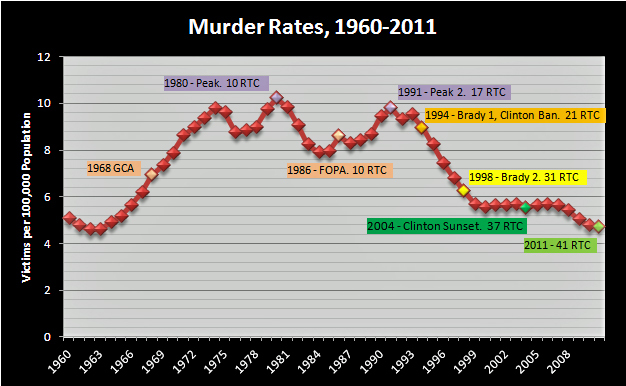 However, the graph below shows that murder rates continued rising after 1968, and peaking in 1980. After enactment of FOPA, murder rates again increased to a second peak in 1991. When the first Brady Bill  took effect in 1994 — background check and 5-day waiting period on handgun sales — murder was already declining. The Clinton gun ban  also took effect in 1994, making it “unlawful to manufacture, transfer and possess semiautomatic assault weapons [or] large capacity ammunition feeding devices [holding over 10 ammunition cartridges].” In 1998, the Brady law replaced waiting periods with the National Instant Check System for all firearms purchase through licensed dealers. Murder rates leveled off between 1999 and 2007, dipping 3% in 2004, the year the Clinton ban sunset, before rising 3% again in 2005. 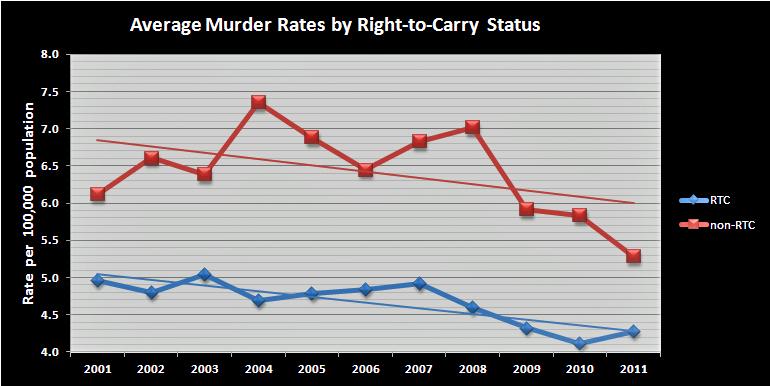 Then between 2007 and 2011, murder rates declined another 16%. But where’s the epidemic “gun violence” problem that gun control is supposed to address? What’s “different” this time? 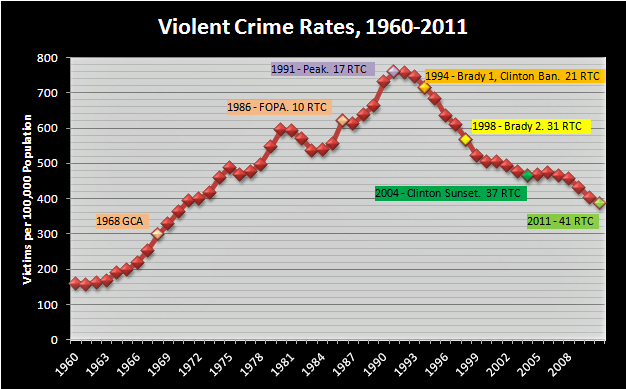 Violent crime rates are lower than they’ve been  since 1970; the murder rate is the lowest since 1963. Yet gun ownership is at an all-time high. The above two graphs also note the number of right-to-carry (RTC) states, where liberalized laws enable law-abiding citizens to carry concealed handguns in public. Prior to enacting these laws, many of these states had outright carry bans . 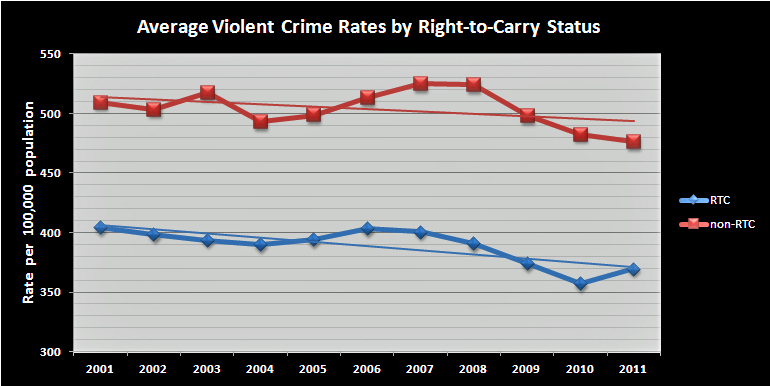 The U.S. Government Accountability Office  estimated that by the end of 2011, there were “at least 8 million active permits to carry concealed handguns in the United States.” The graph below shows that since 2001, RTC states’ violent crime rates were 30% lower, on average, than states which restrict citizens’ right to carry. States like Texas  and Oklahoma  report that women account for an increasing percent of new concealed handgun licenses. These women often are the only line of defense between their children and violent attackers: The Supreme Court  decision of Castle Rock v. Gonzales confirms that police have no duty to protect their children; even a restraining order doesn’t create an “entitlement” to police protection. Debi Keeney of Highland, Illinois,  saved her sister Donna’s life when an intruder broke into her apartment and began choking Donna. This entry was posted on February 14, 2013, 6:48 PM and is filed under Constitutional Issues, Gun Politics. You can follow any responses to this entry through RSS 2.0. You can leave a response, or trackback from your own site.